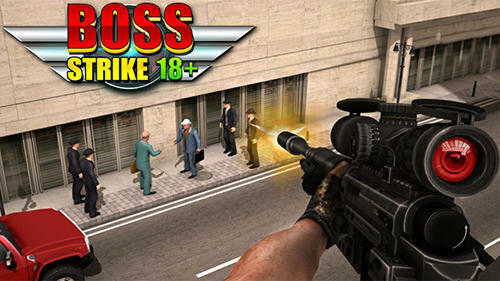 Boss Strike 18+ It’s time to take prompt action against organized crime groups in your country. The Bosses and their evil body guards are all around in the city committing illegal serious crimes. Thousands of life are at stake. The army Intelligence has assigned you risky task to eliminate these dangerous and most wanted criminals. You need to move through the big city and hunt down your enemies. Set the Scope, Aim precisely and blow away your enemies. Don’t miss a single shot. You need to be precise, brave and strong to accomplish this mission. Rely on your shooting skills to finish your work! Kill the high profile targets and their partners. Go for the head shots! It’s a war against deadly criminals. Hold your sniper rifle, Aim and Shoot to wipe off the enemies from your City. Mark yourself as the Sniper warrior of this century! Avail the promo offers, accomplish all risky missions without failing. Be aware of your enemy attacks and don’t kill your team mates while fulfilling your duty. Enjoy shooting in an amazing action packed game! • Brilliant 3D Graphics and Sound Effects! Boss Strike 18+: install APK and play the game.